I find it an intriguing coincidence that the 25th of April marks the commemoration of wartime events in both my country of birth and my country of adoption. In most respects, the two occasions couldn’t be more different: Anzac Day commemorates the service and sacrifice of uniformed troops in a global conflict whose rationale is seldom discussed and poorly understood, whereas the Festa della Liberazione celebrates the irregular partisan troops who liberated Italy from Nazi-Fascist rule, and takes pains to acknowledge the citizens who supported their effort through mass strikes and various acts of solidarity and defiance. Yet in spite of this fundamental (and fundamentally political) difference, the two days share not only a common rhetoric of courage and personal sacrifice, but also a slogan – ‘lest we forget’ – that begs the question of what it is that we ought to remember, by what means and to what end. Earlier this week, Jeff wrote that Anzac Day is in fact a celebration of forgetting. I have no quarrel with his argument, although I find it useful to read it alongside something Scott Hamilton wrote three years ago in relation to the revival of the celebrations in New Zealand. The two essays reach diametrically opposite conclusions, possibly reflecting different realities on the two sides of the Tasman, but agree on one point: that there is to a deficit in the factual knowledge and means of analysis of the apparent object of the celebration, which is therefore apprehended on a different level to that of history and politics, that is to say on the field, respectively, of aesthetics and ethics. 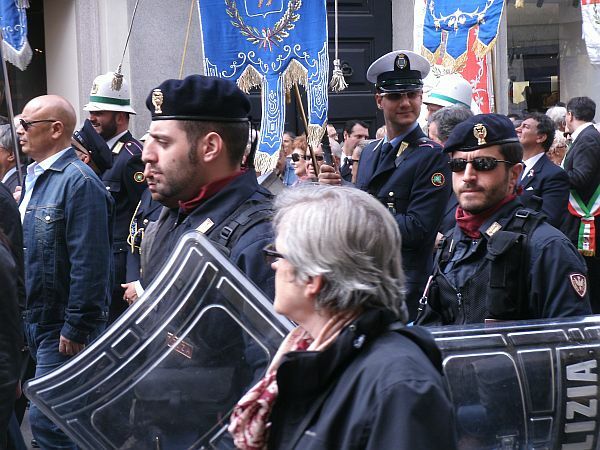 Not so the Festa della Liberazione, which remains contested on strictly political grounds and to an extent that may seem surprising to outsiders. 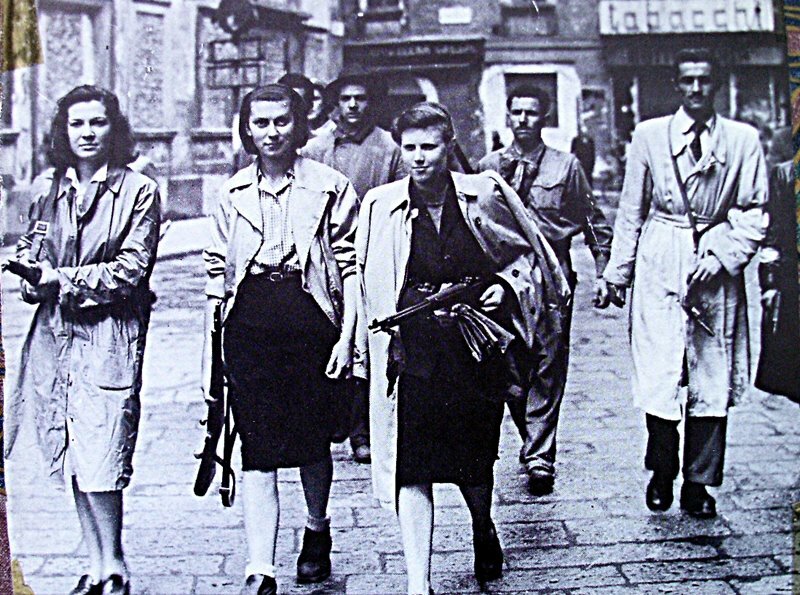 Successive Berlusconi governments and their supporters expended great efforts and political capital in trying year after year to make the day no longer about partisans and the resistance, but rather about all victims of the Italian civil war. Besides the (failed) attempts to enact the shift through legislation, these efforts have included a film adaptation of journalist Giampaolo Pansa’s crisply titled Il sangue dei vinti (‘the blood of the defeated’) as well Renzo Martinelli’s grotesquely revisionist Porzus. 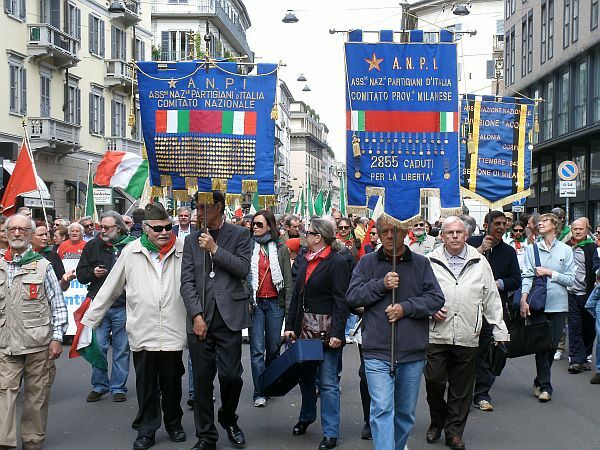 To understand why this new amnesty – following the one promulgated by then Minister of Justice and Secretary of the Communist Party Palmiro Togliatti in 1946 – is so important to the Right in Italy, we must remember that the Italian Constitution is grounded on anti-fascist principles, and includes an explicit prohibition to reform the fascist party. But more importantly the document – with its emphasis on the rights of the citizen to employment, housing and equal participation in society, and the duty of the state to create the conditions for the full realisation of these rights – reads nowadays like a manifesto against neoliberalism. 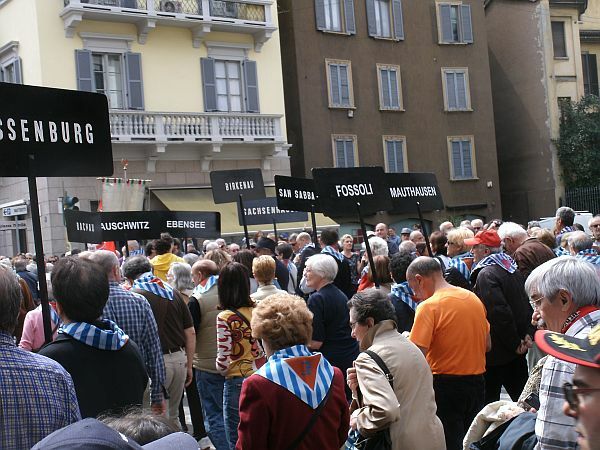 To attack the memory of the resistance, to make the men who chose to fight alongside the Nazis in the Republic of Salò as worthy of civic remembrance as the victims of their terror and the partisans who defied them, is an implicit attack on the constitution that the men and women of that movement went on to write; and to attack the constitution is in turn the means to not only legitimise the most violent and racist fringes of the Right, but also the kind of reforms enacted by the current ‘technical’ government with the support of the near-entirety of our elected Parliament. This is the fraught terrain on which the memory of the resistance is contested, and it’s a struggle that doesn’t spare from criticism the very custodians of the memory. This banner was put up at a small local commemorative event I attended this morning. 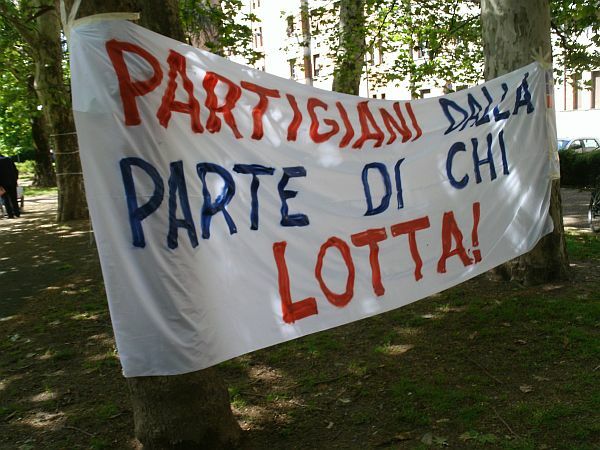 It reads Partisans side with those who struggle!, but it’s not a statement of fact: it is an exhortation, a demand that the partisans’ association – which has close ties with the Democratic Party that supports the government – show greater solidarity with the opponents of Monti’s reforms and the abrogation of our democracy. ‘Only the oppressed can know the need for liberation’, reads a document of the social centre behind that banner, and further, ‘memory is partisan’. 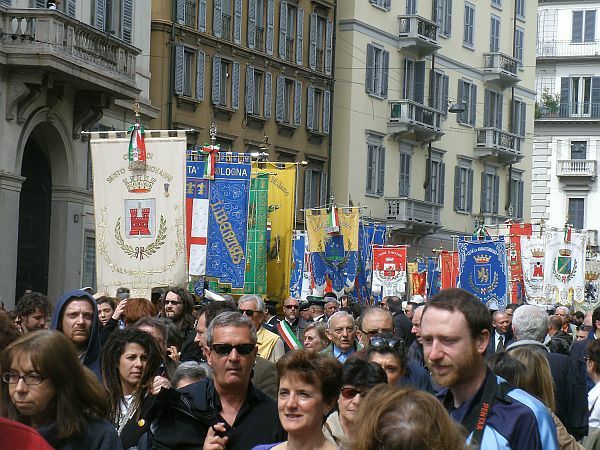 I thought of that line later in the day as I attended the national Festa della Liberazione march with my son. If memory is partisan, then so is history. And if history is partisan, then so is the city, so is society. 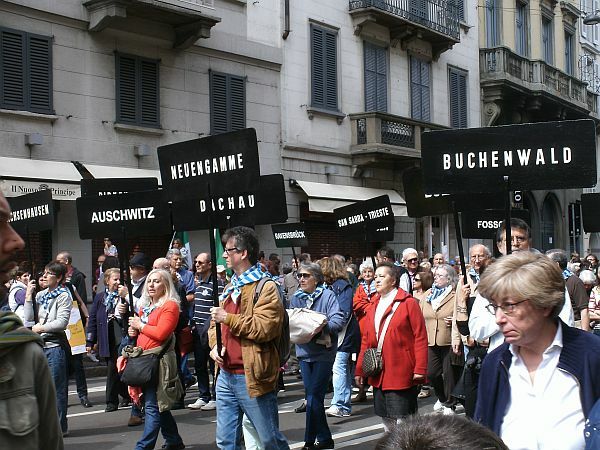 Tens of thousands of people marched in Milan today. Naturally the number of actual partisans and survivors is now greatly diminished, and so the symbols were mostly carried by others. That is the process of our renewal, and in spite of the foregoing, in spite of the trouble with carrying that memory, with doing justice to it and with using it as an instrument for justice, there was that feeling again, of being amongst my people, of being part of a mass movement. We are the partisans’ association too! Let’s not be saddled with the debt of the great infrastructure works. 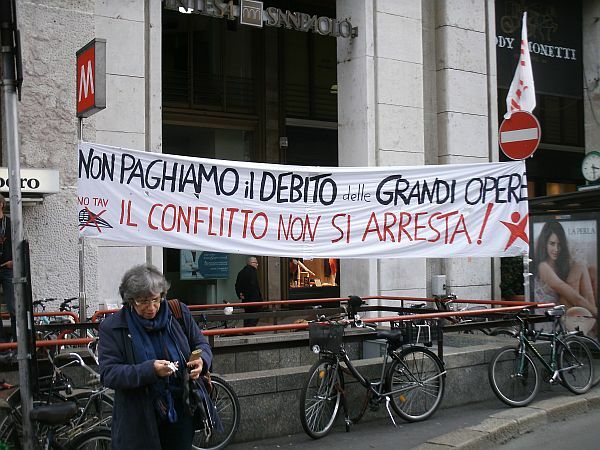 You can’t arrest the struggle! 25th of April: let us free ourselves from the dictatorship of the markets. Standards of two branches of the partisans’ association (ANPI). This, too, is the city as memory, nowhere more so than in the last two images. 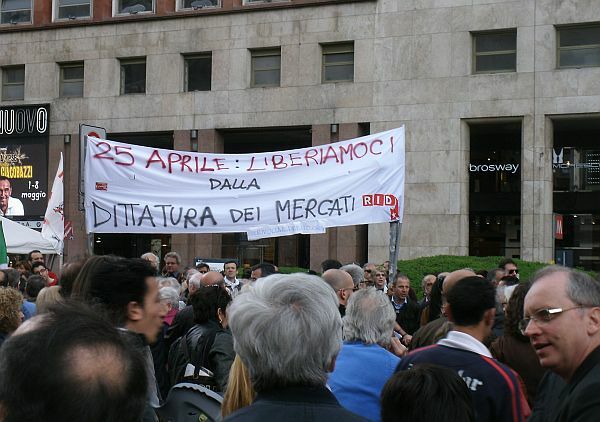 Because finally the 25th of April is also, if not predominantly, that: an act of communal, defiant remembrance. I was glad to be a part of it again. Given the number of right-wing muppets who bang on about the correlation between free markets and personal liberty, documenting the relationship of neoliberalism with military repression is really important. I’m still trying to think more about the points you made about memory in your last post. which touches upon similar issues. 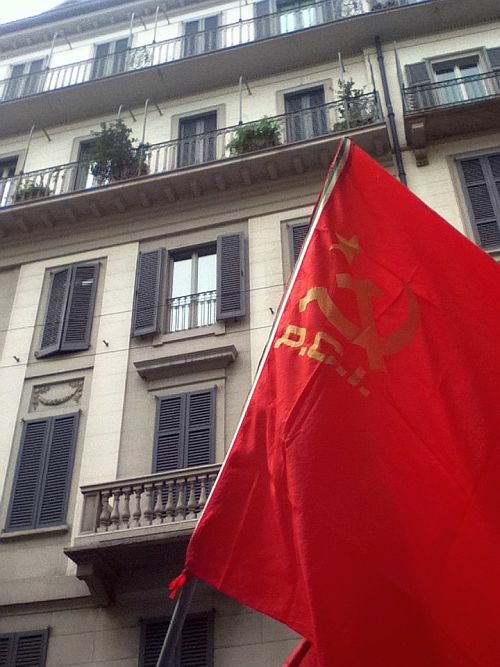 The stories of Chile and Argentina still reverberate very strongly in Italy, especially the former. In fact El pueblo unido was sung quite both during the march and in the smaller gathering I attended in the morning. Thanks for the link. I’d like to let the author loose on the NZ army museum in Waiouru. 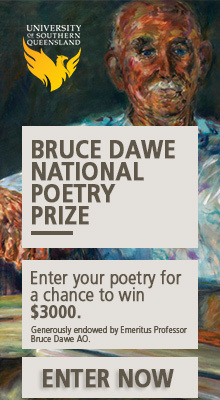 Your post reminds me of something I read recently: can’t remember where; can’t remember when. Something to the effect of time moving in slow motion in stressful situations – the brain writing memory more closely. I feel indebted to partisans past and present, who have worked and sacrificed for the benefit of others. As you point out the media magnates would like to rewrite history, to divert attention from the creeping and sweeping destruction of civil and workers’ rights. I would take up arms against the neo-liberal’s attack on democracy, but where does one start, when so many are mesmerised by the incessant imprinting from all forms of media? In Australia the leader of the opposition party has the swaggering violence of a facist, with complete support from transglobal business interests and the media, he paralyses parliamentary and media debate by denigrating our brilliant female Prime Minister. Thank you Peter. I must say though, without possessing anything but the most cursory knowledge of Australian politics, that I am a little perturbed by the use of phrases like “the swaggering violence of a fascist” to describe somebody like Tony Abbott. If the results of today’s Greek elections teach us anything, is that devaluing words like fascist or Nazi makes it that much more difficult to raise the appropriate levels of alarm when actual, honest-to-god neofascists and neonazis get elected to a national assembly. I’ll have a little more to say on this topic later this week, but I think it’s important to strive for precision when using these terms. The connections I have suggested in the post notwithstanding, neoliberalism isn’t the same thing as fascism (although it’s certainly possible to enforce neoliberal reforms through fascistic means – but I really don’t think it’s the case of Australia). This matters also in relation to your question of how are we to mount an effective opposition. 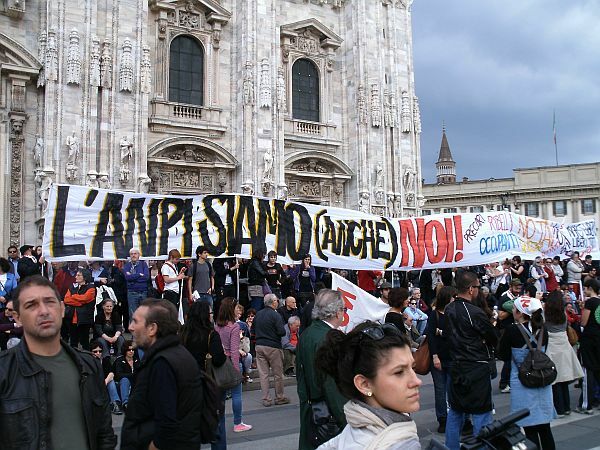 I am upset that a group of Forza Nuova supporters was allowed to march in Milan largely unmolested last week, because ultimately that’s how you oppose neofascists: you react to every act of intimidation; you mobilise and send three, four, five (preferably ten, twenty) people on the street for each one of theirs, and reclaim one by one the public spaces that they seek to occupy. Neoliberalism gives you no such targets and needs to be fought on an entirely different – and constantly shifting – terrain.